All transactions are safe and secure with a reliable history in online purchasing behind each of our associates. 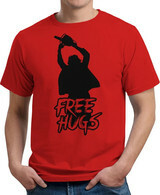 Buy the Texas Chainsaw Massacre Italian Movie Poster Art t-shirt to own Texas Chainsaw Massacre clothing and merchandise. The front of this Leatherface t-shirt displays the artwork from the film's Italian movie poster. The image on the T shows a rendition of actor Gunnar Hansen, decked out in his Texas Chainsaw Massacre costume that includes unkempt hair and a mask of human flesh. A bloody hand is reaching up in front of the villain, whose white shirt is stained with blood. Capture these scenes with Leatherface toys and Texas Chainsaw Massacre action figures. In addition to the Texas Chainsaw Massacre Italian Movie Poster Art tee above, browse the Texas Chainsaw Massacre Clothing Gallery for more apparel like men's and women's clothes, kids shirts or hoodies.